When I think about a green car, the first thing that comes to mind is a Toyota Prius. When I think about a car designed to destroy the environment, the first thing I think of is GM’s Hummer. So when I heard about a GM presentation, being held at Columbia University, titled, “What Does Sustainability Mean to General Motors?” I thought my eyes were playing tricks on me and somehow misread the word sustainability for profitability. Lawrence D. Burns, vice-president of GM’s R&D and Strategic Planning Division, gave the presentation. Burns comes off very friendly and personable (I’ll call him Larry from now), not the stereotypical image of an inefficient Detroit auto executive salivating at slashing factory jobs. In fact, Larry seems like he could actually care about the environment and wears Birkenstocks. Though not an idealist, Larry immediately ties GM’s sustainability to profitability (I guess I didn’t misread things after all). He cites how 900 million cars occupy roads worldwide today and how the market is poised to have strong growth. But he accepts that global warming is real and the environment simply cannot sustain billions of petroleum-based autos on the road. Thus, it is his responsibility to lead GM in developing engines that shy away from petroleum so GM can continue to sell cars in 2100 and beyond. So what are these Jetsons-like technologies Larry is talking about? One is being able to derive ethanol from garbage using bacteria (Alright, that one sounds more Flintstones-like). Apparently, GM has been on a shopping spree buying biotech companies such as Mascoma and Coskata that are developing organisms to sequester ethanol from non-food sources and being able to do it for as cheap as $1 a gallon. Other technologies GM is working on are improving electric vehicles (both hybrid and stand alone), and hydrogen. GM is set to introduce the Chevrolet Volt, a long range, plug-in all-electric car, in 2010. 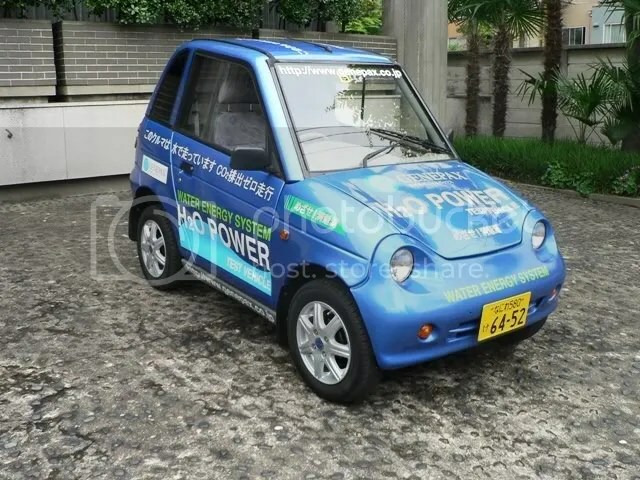 This is a significant upgrade to the first all-electric car, the EV1; popularized in the documentary, “Who Killed the Electric Car?” (Hint: The killer, a corporation, is mentioned several times in this blog post). Like Honda and BMW, GM is also testing hydrogen-running cars on the streets of LA. But the challenge remains making it affordable with mass production. What is sadly missing is just trying to use plan old water to run cars (see my previous post about Genepax and their prototype car that is fueled by water). Larry’s presentation was refreshing and gives hope to the environmental challenges our generation faces. It makes GM almost seem like a green company and in the future that may very well be the case. Besides all the technological hoopla about their cars, GM has won several awards on energy efficiency at their plants and recycles nearly 88% of their waste. But is GM really a happy, do-gooder company now and no longer the big bad wolf? Obviously not, GM just has the foresight to realize that their company will only be sustainable if it moves away from petroleum-fueled vehicles. In fact, I believe that when we look back at today in the future, the current run up in high gas prices, however painful, will have been considered a catalyst in forcing automobile companies to speed up the development of energy-efficient cars. Hopefully, along the way, GM and other automobile companies will transform from being seen as big bad wolves for the environment to doing something that changes things for the better.